Omaha, Nebraska. Maybe not the location that you would expect to find one of the most unique, history-altering Corvette clubs in the country. But from 1957 to 1981, that’s just what they had. The Tangier Shriners are headquartered in Omaha, and during that 24-year period, about 13 members formed the Tangier Shrine Corvette Patrol. Each year, these members would purchase a fleet of brand-new, identical Corvettes. They would then take these unique cars to parades, circuses, and other events around the country, and perform precision driving demonstrations to bring attention to their children’s burn hospital efforts. The Corvettes were ordered through Chevrolet’s Central Office Production Order (COPO) program through Anderson Chevrolet in Wahoo, Neb. Usually there was something a little different than your run-of-the-mill Vette—maybe a special color, radio delete, or something less obvious. The Shrine Patrol members would then head to the St. Louis manufacturing plant, where they picked up their new fleet of cars fresh off the line, and drove them back to Omaha in a caravan. Obviously, the guys that were buying these cars had some money. You don’t just buy a new Corvette every year if you’re struggling with the rent. And certainly, this group consisted of lawyers, doctors, and other businessmen. To that end, the Corvettes that were waiting for this conservative group in St. Louis in 1962 were probably quite a shock. Katie Frassinelli from the National Corvette Museum in Bowling Green, Ky., sent me some information that states that GM President Bunky Knudsen gave the Tangier Shrine Corvette Patrol the green light to order any color they wanted from any GM vehicle. The Shriner director, Quay Fitch, chose a Cadillac color called Royal Heather Amethyst. The metallic purple is really a pretty nice color, but when he chose to pair it with red interiors, the outcome was a bit weird. The story goes that from 1963 forward, members had to vote on the final color choice before the order was placed. 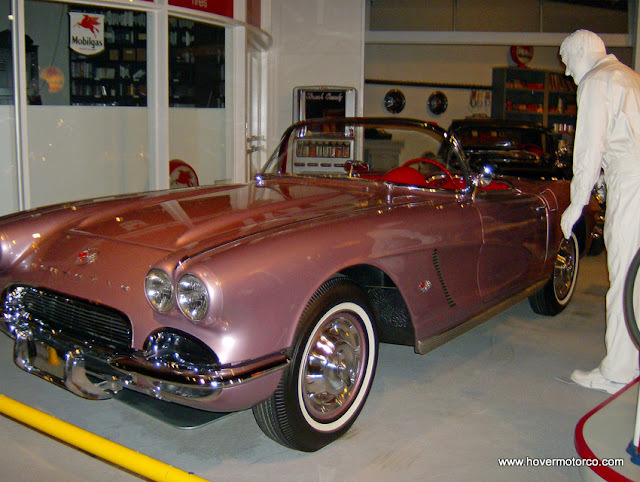 A purple and red ’62 Corvette is an extremely rare sight today, but if you had one, you’d get a lot of people telling you it didn’t come that way. I actually remember going to the Shrine Circus in Omaha and seeing the Corvette Patrol in action in 1978. They were driving black and silver Indy pace car replicas that year, and I distinctly remember how cool I thought they were. 1978 was also the year that my dad’s former Shrine Patrol Corvette came into our lives. With the base 230-hp 283, Powerglide automatic transmission, and Ermine White over Jewel Blue paint scheme, the old ’61 isn’t what you’d call outstanding by Corvette standards. But it has a great history, and it is cool to look back at the old photos and realize that this car was actually participating in these precision driving demonstrations. Not that I would consider the driving dynamics of that car to be very precision. I love it, don’t get me wrong, and it has sort of an enjoyable, highly-involved driving quality to it. But I’m pretty sure that an ’88 Cavalier would out-handle it. It’ll flood-out if you turn left too hard. And the drum brakes will stop it on a roll of dimes. If that was what they used for precision driving demonstrations in 1961, it really shows you how much things have changed in 50 years. As an interesting side note to this story, the Omaha Tangier Shriners also had an Imperial Motor Patrol from 1959-1968. Members of this group, known as the “Imps of Omaha,” would fly to Detroit each year to take delivery of their big Chrysler Corporation convertibles, and of course drive them back to the Cornhusker state. The cars were ordered from Briley Motor Co., in Omaha. This group had about 20 members, and the cars were usually among the first 20 off the line for each year. 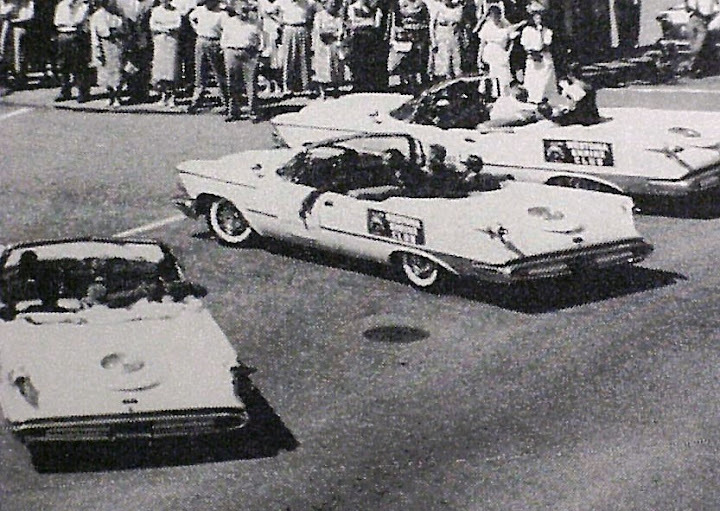 The Imps of Omaha used their fleet for many of the same things as the Corvette Patrol, driving them in parades and other special events. While I was putting this story together, I came in contact with several interesting folks who have some connection to the Omaha Shriner Corvettes. Wayne East owns a perfectly lovely 1967 Shriner car, and is working on a Shriner Corvette registry for the approximately 300 cars that were built between 1957 (when they were equipped with special horns that sounded like a cow "moo") and 1981. Gar Anderson is a son of G.W. Anderson, the Nebraska dealer who sold these cars new. He still has all kinds of information and memories about this program. Although they don’t have this exact program anymore, the Omaha Tangier Shrine Temple is still in operation, and they still have a Corvette club (today, they don’t have to all match). Several members from that organization were willing to share information with me, including Leonard Crossley, Sully Sullivan, Barry Ahlborn, and James Smith. Many of the photos in the slideshow below came from the collection of Tangier Shrine member Jerome Givens. I also want to thank Cythia Walling. Her dad was a member of the Shrine Corvette Patrol, and she generously provided several of the photos for this story. Of course, this is an ongoing search for me. I would love to see more photos of these cars in action. 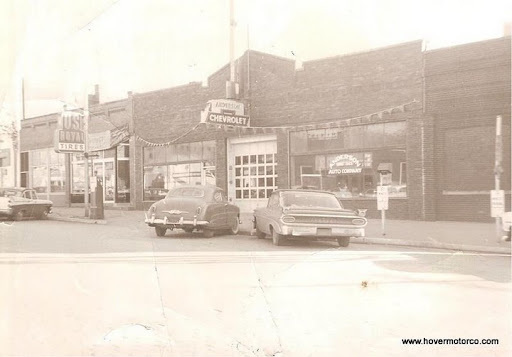 I would especially like to see more pictures of the ‘61s from back in the day. I’m always on the lookout, and would welcome and appreciate any tips that you might have for me about the original Tangier Shrine Corvette Patrol. In the meantime, I hope you enjoy some of these great pictures that have been provided to me from several sources. It would be pretty awesome to see these cars in action today. My wife's grandfather, Jerome Given, was potentate in 1963 and also in the corvettes. Over the years he has told me many stories of these cars and times. I have plenty of pictures my wife and I are looking through. 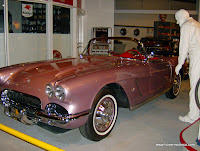 My dad purchased a used 1960 Corvette in the early 70's in Omaha that was a previous shriner car. It had the 283 and a powerglide. I was very young at the time, but from pictures he has it was a grayish blue. I would love to track down this car. If anyone knows of a 1960 Shriner car out there, please email me. My father was Jim Carpenter, one of the original 13. I was so priviledged to grow up in this era. I have the most wonderful memories and photographs. I not only had one awesome dad, I had 13! Thank you Craig for this remarkable tribute to these fine men! in my experience with the group, you could order odd stuff. my 70 and 71 small motor factory deliveries had the "big motor" hoods and i bought 427 numbers and glued them on. i was in partners with a 68 and 69 and my partner and i each had a 70, 71, and 72. i went on to have a 1984, 87, 2000. i currently have a 2015. Garwood Anderson was the dealer in Wahoo, Ne. that sold the Shriners the cars every year. He was also a Shriner and bought and drove a new one every year. He threw me the keys to his "purple" with red interior '62 and told me to wash it while he and my step-dad were picking up the '63's that year. His was a 327/300 four-speed. What a blast!! Garwood had twin boys, Garwood and Gaylord. Garwood sr is deceased. Garwood jr lives in Loveland, Co. Gaylord lives in Wahoo, Ne. Do a google search to find his address and phone number. He continued in the car business in Wahoo for some years and probably has all the records, which should include a complete run of all the VIN's etc. That is sooo neat~ Harold (Curly) and Addie Steinbauer were some of my favorite in the group! Congratulations!